He’s 42! How does he still look like this? Remember the video to ‘Give It Away’? 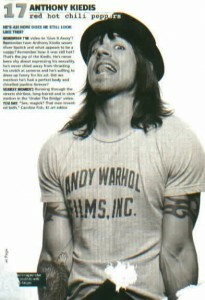 Remember how Anthony Kiedis wears silver lipstick and what appears to be a nappy? Remember how he was still hot? That’s the joy of Kiedis. He’s never been shy about expressing his sexuality, he’s never shied away from thrusting his crotch at cameras and he’s willing to dress up funny for his art. Did we mention he’s had a perfect body and chiselled jawline forever? Sexiest moment: Running through the streets shirtless, long-haired and in slow motion in the ‘Under The Bridge’ video.